Sea scallops, a form of mollusk, have many nutritional benefits, including having lean protein, and various vitamins and minerals. They make a good addition to a weight-management plan, as they're low in calories. Using a low-fat method of cooking, such as grilling, broiling, steaming or sauteing helps keep the calories down. The flesh of this shellfish is slightly sweet and moist, and pairs well with garlic, onions and herbs. One major benefit of sea scallops is the low-fat protein they provide. Eating 3 ounces of steamed scallops gives you 18 grams of protein, with less than 1 gram of fat and only 94 calories. Your body requires amino acids from protein to maintain muscle mass, healthy tissues and body fluids. Choosing lean sources of protein may also help prevent excess caloric intake and an elevated cholesterol level. Vitamin B12 is a water-soluble vitamin found in the flesh of scallops. A 3-ounce serving of scallops provides 1.8 micrograms of vitamin B12, which is 75 percent of the amount adults need per day. Your body relies on B12 for red-blood cell formation, DNA synthesis, proper neurological function, and fat and protein metabolism, according to the Office of Dietary Supplements. Eating sea scallops helps you meet your daily need for B12 and prevents deficiency symptoms such as anemia, fatigue, depression and problems with memory. Sea scallops provide varying amounts of every essential mineral. Those found in the highest percentage of your daily needs are the trace minerals selenium and zinc. 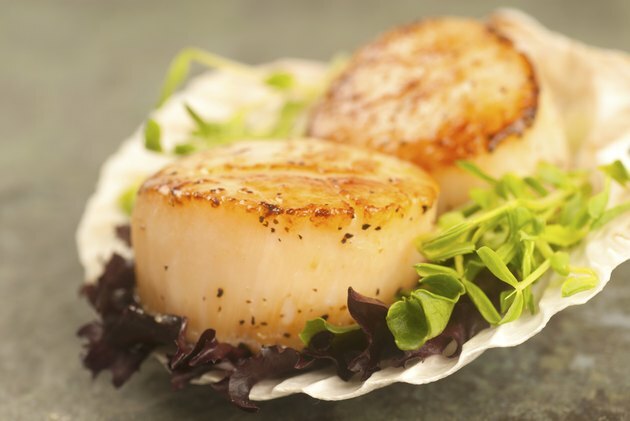 A 3-ounce serving of scallops gives you 18.4 micrograms of selenium, which is 26 percent of the recommended daily value, and 1.3 milligrams of zinc, which is 9 percent of the daily value. Selenium functions as an antioxidant in your body, and helps prevent damage from harmful free radicals. Zinc plays a part in more than 100 different enzyme reactions in your body and helps maintain your immune function, protein synthesis, wound healing and cell division. In addition to lean protein, vitamins and minerals, sea scallops give you small amounts of omega-3 fatty acids. These fats are essential to your health, and your body is unable to make them, meaning that they must come from your diet. Omega-3s play a role in maintaining proper brain function, growth and development. They also function to help reduce inflammation and to lower your risk of developing cancer, heart disease and arthritis, according to the University of Maryland Medical Center.